Serving North Idaho’s RV Rental Customers for over 15 Years!!! Did you know ??? Most of North Idaho’s Campgrounds take reservations 9 months in advance so most reservations are made in November and December!!! Please start thinking about next summer. Once you have reserved your campground space, give us a call to reserve your RV for those dates. If you have any questions, give us a call and we will be happy to answer them. Scroll down for a list of Sandpoint area RV Parks. North Idaho RV Rentals has been serving the Sandpoint RV Rental market for over 15 Years. Since 2000, North Idaho RV Rentals has been the premier RV Rental Company serving North Idaho and all of the Inland Northwest!!! Our primary business is renting travel trailers that we deliver and set up for our customers in the many campgrounds around the area’s beautiful lakes. Customers reserve their campground and RV and we have it setting in their site waiting on them when they arrive…. Nothing could possibly be less stressful and more enjoyable for your summer vacation. Give us a call and let us make your next vacation one to remember. 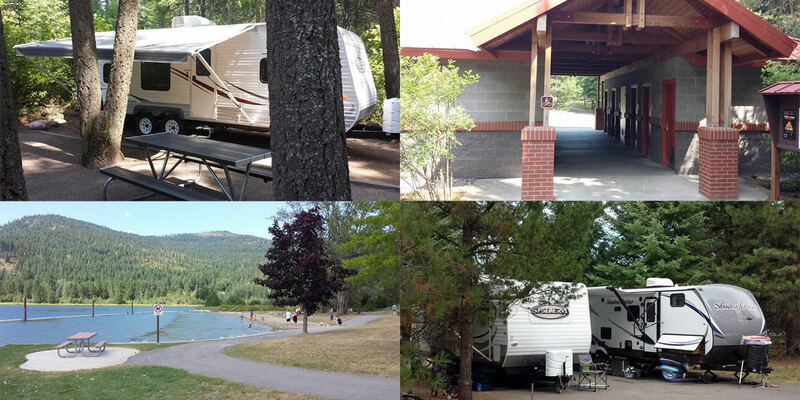 Silverwood RV Park is very often totally booked up. However, now you have another option. The new Ravenwood RV Park is just a mile away and their..
Lake Pend Oreille in the northern Idaho Panhandle is the largest lake in the U.S. state of Idaho and the 38th-largest lake by area in the United.. If camping on one of North Idaho's beautiful lakes interests you then follow us !!! July is ending very hot & dry in North Idaho !!! Please be careful with your campfires !!! I can't believe we still have a 10 day & two 7 day openings the last week of July !! !